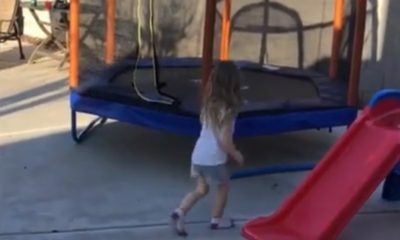 VIDEO: Cute Kid Copies Her Dad's Strong Reactions To Basketball Game - POP GOES THE WEEK!! This little girl is absolutely adorable. Watch as she mimics her dad, who is outraged at a basketball ref’s call. Okay, the dad could stand to watch his mouth a little bit… but the kid is pretty darn adorable! TODAY’S MOOD LIFTER: This Baby And A Butterfly Will Cheer You Up.